This is a children’s play area with trampolines, foam chunks, basketball hoops, slides, dodgeballs and climbers. The staffs are very careful and dedicated towards the customers. They take care of the safety of the kids. The place is regularly cleaned and lots of improvements are made. You can have some tea or coffee or even a meal at their cafeteria. The place also has a private party area, where you can organize your kids' birthday parties. 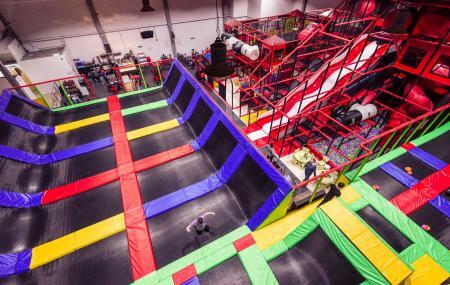 The kids will love the bounce experience as they can pound around the wall to wall trampolines spread over nine thousand square feet. The foam pit is huge, where the kids can dive and flip over. There is also a toddler zone. The 3-storey soft play adventure is equipped with slippery slides, deep ball pool, cool foam ball guns, kiddie zip wire, rope bridges and tunnels. Personalize your visit to the city by chalking out a plan using Basildon trip planner. You won't miss your home when in Basildon, hotels in Basildon like Muthu Westcliff Hotel, Holiday Inn Basildon and The Chichester Hotel offer some of the best places to stay in the city. Find out how to reach Basildon to begin with. Plenty of wholesome Basildon vacation packages are available to choose from, pick your today! Love this? Explore the entire list of places to visit in Basildon before you plan your trip. Fancy a good night's sleep after a tiring day? Check out where to stay in Basildon and book an accommodation of your choice. People normally club together Fantasy Island and Upminster Tithe Barn while planning their visit to Dropzone. My 1 year-old enjoyed herself but the under-4's area needs to be maintained better. I found a large screw on the baby trampoline (part of the frame), which I'm glad I found before a toddler did. In response to the owner: There wasn't anybody at the desk on my way out, but I checked the trampoline beforehand to make sure it was still safe without that particular screw. Had a fabulous day out with the kids at Dropzone special thanks to staff marshal Morgan who's interactions with the kids made it extra special. Nice to have staff members that care. I was really disappointed. This place is dirty. The under fives area is miserable. The ball pools are practically empty of balls and what's left is broken. Waste of time and money. Seating area is cramped. The frame is broken missing steps. One area of the frame is not covered with the padding. All the ball machines weren't working at all. I don't recommend going to this place. Not very clean in there, all staff were grumpy and cost a lot.